Topics: Charitable Initiatives, Special Events, Bar & Bat Mitzvahs, Aerial Acts For Hire, Ground Acts For Hire, & Shows. 14 users visit the site each day, each viewing 3.00 pages. 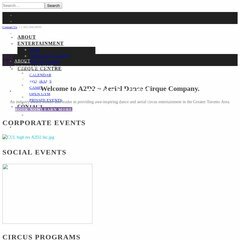 It is hosted by Suresupport Llc (Massachusetts, Waltham,) using Apache web server. Its IP Number is 64.14.74.74. It has 2 DNS records, ns2.s434.sureserver.com, & ns1.s434.sureserver.com. PING www. (64.14.74.74) 56(84) bytes of data. A time of 57.9 ms, is recorded in a ping test.